This image presents a composite of X-rays from Chandra (red, green, and blue) and optical data from Hubble (gold) of Cassiopeia A, the remains of a massive star that exploded in a supernova. Inset: A cutout of the interior of the neutron star, where densities increase from the crust (orange) to the core (red) and finally to the region where the "superfluid" exists (inner red ball). The ultradense core of an exploded star contains a bizarre form of superconducting matter called a superfluid, new studies suggest. 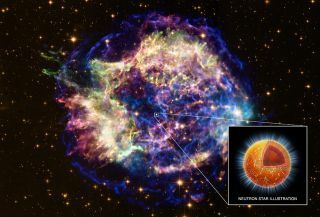 Two teams of researchers using NASA's Chandra X-ray Observatory detected a rapid dip in the temperature of Cassiopeia A (Cas A), which is a neutron star — the remnant left behind when a massive star ends its life in a supernova explosion. The huge temperature drop is solid evidence for the presence of a strange state of matter in the core of Cas A, researchers said. "The rapid cooling in Cas A’s neutron star, seen with Chandra, is the first direct evidence that the cores of these neutron stars are, in fact, made of superfluid and superconducting material," Peter Shternin of the Ioffe Institute in St. Petersburg, Russia, said in a statement. He is leader of one of the teams. Superfluids made of charged particles are also superconductors, which allow electric current to flow with no resistance. Cas A is the remnant of a huge star that exploded about 330 years ago. The neutron star is about 11,000 light-years away, in the constellation Cassiopeia. Researchers in both of the new studies found that it has cooled by about 4 percent over a 10-year period. "This drop in temperature, although it sounds small, was really dramatic and surprising to see," said Dany Page of the National Autonomous University in Mexico, leader of the other research team. "This means that something unusual is happening within this neutron star." The pressure in the star’s core is so immense that most of the electrons there merge with protons, producing neutrons, researchers said. Physicists have developed detailed models to predict how matter should behave at such high densities, including the possibility that superfluids may form. Superfluidity is a friction-free state of matter, and superfluids created in labs here on Earth exhibit remarkable properties. It can climb upward, for example, and escape airtight containers, researchers said. In their studies, both research groups found evidence that Cas A's rapid cooling is due to the formation of a neutron superfluid in the neutron star's core, and that this happened within the last 100 years or so. The details of Shternin's study will appear in the journal Monthly Notices of the Royal Astronomical Society Letters. The reseach by Page and his team will appear in the journal Physical Review Letters. Cas A's dropping temperatures are consistent with theory, which predicts that a neutron star should undergo a distinct cool-down during the transition to the superfluid state, researchers said. During this time, nearly massless, weakly interacting particles called neutrinos form in huge numbers and then escape, taking energy with them. The cooling is expected to continue for another few decades before slowing down, researchers said. On Earth, the appearance of superfluidity in materials occurs at extremely low temperatures, near absolute zero, about minus 273 degrees Celsius (minus 459.6 degrees Fahrenheit). But in neutron stars, it can take place at temperatures near 1 billion degrees F because interactions of particles occur via the strong nuclear force — the force that binds quarks together to make protons and neutrons, and protons and neutrons together to form atomic nuclei. Until now, there was a very large uncertainty in estimates of this critical temperature. But the new research pins it down to between 900 million and 1.8 billion degrees F (500 million to 1 billion degrees C), researchers said. "It turns out that Cas A may be a gift from the universe because we would have to catch a very young neutron star at just the right point in time," said Page’s co-author Madappa Prakash, from Ohio University. "Sometimes a little good fortune can go a long way in science." The researchers said their findings suggest that the Cas A supernova remnant can serve as a good test bed for studying how ultradense matter behaves at the atomic level. These results are also important for understanding the diversity among neutron stars, including pulsation, magnetar outbursts and the evolution of powerful neutron star magnetic fields, researchers said. The new studies could also help scientists better understand small, sudden changes in highly magnetized, rotating neutron stars known as pulsars. Past studies of the pulsar changes, known as glitches, have yielded evidence of superfluid neutrons in the crust of a neutron star, where densities are lower than in the core. The new research on Cas A, however, provides the first direct evidence for superfluid neutrons and protons in the core of a neutron star, researchers said.